This spider is usually large and hairy. An adult is at least a 1/2 inch long. Because there are many different species of wolf spiders, there are a wide variety of colors. It usually has a gray or dark brown color with a distinct orange coloring on the front of the chelicerae and patterns on the front or abdomen. Its body is generally robust with eight thick legs that are sparsely covered by hairs. The fourth pair of legs are usually the longest. Like other spiders, two body segments (the cephalothorax and the abdomen) and spinnerets that make silk. 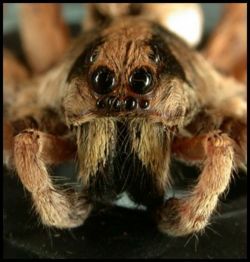 They also have two sets of mouthparts: pedipalps and poisonous, fang-like chelicerae .The wolf spider has a well-developed nervous system with a brain and impeccable eyesight. A key identifying characteristic are the eyes. Four larger eyes form a square above a row of four small eyes. The posterior set of large eyes face slightly up. The middle set of large eyes face forward. A row of four smaller eyes lay below the two sets of large eyes. These spiders also breathe using book lungs (organs that have layers of respiratory tissue) and have open circulatory systems (Miller and Levine, 717). Mating generally occurs outside a female's burrow at night. Males began to wander looking for a mate in the summer rainy season. They are first attracted by the female's pheromones (chemical messengers that trigger a response in other animals). Upon finding a female, the male will then begin a courtship ritual in which he will tap his legs in a certain way, drum with his pedipalps, and create sounds by scraping the pedipalps together (a process also called stridulation). Wolf spiders will mate for life and are generally together except during rainy seasons. Sometimes, single males will attack another male to win that male's mate. Once the eggs are fertilized, the female will create a large egg sac that is often made of white silk and shaped like a ball. She will then carry the egg sac by attaching it to her spinnerets. When the eggs hatch after about a month, the mother will tear open the egg sac and will carry the young spiders on her back. The young spiders will remain there by holding onto specialized hairs. This degree of parental care is a rare phenomenon for most spiders. When they are ready to leave their mother, the spiderlings will leave on the ground or balloon (float with the breeze using their silk). The average life span for a wolf spider is two years. Species of wolf spiders are found in a variety of different habitats all over the world. 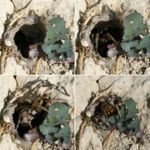 Although public opinion is that wolf spiders are confined to hot and dry areas, wolf spiders have actually been found in places with an extremely cold climate like the Arctic. They are abundant in alpine and prairie areas. They live mostly on inland regions and generally have very specific microhabitat preferences. For example, their preferences could be as general as a cold climate to a stream-side gravel bed. The wolf spider does not build a web. Instead it either wanders and retreats in vegetation or it builds a silk-lined burrow. Some of their burrows are open while others have a trapdoor made of leaf litter or grass and silk. Wolf spiders usually live near each other in small colonies. Each species has a different type of burrow to help it survive certain conditions. For example, the arid zone species will build turrets to keep floodwaters out. Wolf spiders often come indoors seeking warmth in the winter. These pests are discovered near doorways, windows, basements, and other indoor locations. Most often however, the wolf spiders are spotted in gardens or scurrying across the ground in search of prey. While they may seem like pests, they serve as an important natural control on harmful insects. Their aggressiveness as predators helps reduce and maintain insect populations and the ecosystem. Wolf Spider by unknown. Arizona-Sonora Desert Museum. Wolf Spiders by unknown. Oklahoma State University. Wolf Spider by unknown. Everythingabout.net. Insect Identification by unknown. Whitmore Micro-gen Prescription Treatment. 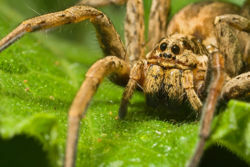 Wolf Spider by unknown author. Microsoft Encarta. Wolf Spiders by Jim Cornish. Elementary Theme Pages. This page was last modified on 25 July 2014, at 11:09.